Heavy metals may enter the human body through food, water, air, or by absorption through the skin. These toxins contribute to serious health problems in the human body. If you have dental fillings, have been vaccinated or have eaten seafood, then your body is most likely to be contaminated. It’s important to cleanse our bodies on a cellular level. You can do this through eating cleansing foods (organic fruits and vegetables) and drinking vegetable juices. 1. Wash all ingredients. Choose organic if possible. 2. Run all the ingredients (minus chia seeds) through the juicer, or blend all ingredients (minus chia seeds) in a blender if you don't have a juicer. 3. If using, add the chia seeds to your prepared juice, and leave to soak for about 10 minutes. Chia seeds contain water soluble fiber, which gives them a gel-like consistency once the seeds are soaked. This gel absorbs the toxins in your digestive tract, helping your body cleanse itself. Why Drink Red Juice ...? Juice and drink . Enjoy ! This is a fantastic drink to replenish the body and in particular the adrenal glands. When the adrenal glands are put under pressure by stress and ineffective food and drink choices, this directly harms the liver and pancreas making us feel lethargic. Best time to drink this tonic is first thing in the morning to allow the body to absorb and reset ... Enjoy ! Juice all ingredients and add to coconut water. C.A.B.A.L.A. juice is actually a combination of juices consisting of carrots, red apples, beets, yellow apples, lemons and green apples. It’s an Ancient drink that targets the health and functional capacities of your Vision, Heart, Brain and Skin. You’ll look better and feel better with natures organic medicines! For 60 days Joe drank nothing but fresh fruit and vegetable juice in his film Fat, Sick & Nearly Dead. During that time he relied on this simple, yet satisfying juice. 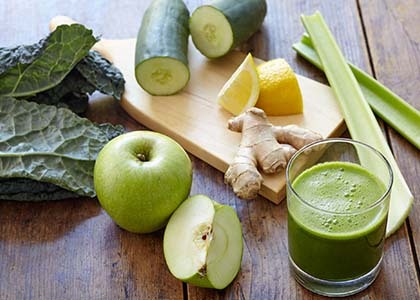 It is a great juice for boosting your immune system and keeping your whole body clean, healthy, and energised. 2.Peel the lemon and core apple. 3.Add all ingredients through juicer and enjoy! Peel the grapefruit, leaving the white pith to make the juice more nutritious. Juice the pineapple (no need to peel if you have a good juicer) with the grapefruit and ginger. Pour the fresh juice into a glass over ice until two-thirds full. Top-up with the sparkling water. A terrific blood cleanser . Enjoy ! Cucumber juice is a highly alkalinising and a hydrating drink that is rich in nutrients such as vitamins A, C, K, magnesium, silicon, and potassium. It has the ability to cleanse and detox the entire body as well as help to alleviate digestive problems. It is also an ideal way to properly hydrate the body since it is contains beneficial electrolytes that have the ability to bring nutrients and hydration deep into the cells and tissues making it far more effective than water alone.